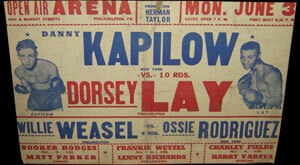 The last remaining boxing legend of Philadelphia’s golden era of the 1940’s passed away on March 17th. Dorsey Lay was a prominent lightweight boxer who competed in perhaps the finest era of 135-pounders and compiled a professional record of 40-18-1, 15 KOs. Born in LaGrange, GA on December 31, 1924, Lay was 91 at the time of his death. Lay was a fine amateur before turning pro, and placed second at the 1941 Mid-Atlantic AAU tournament, representing the Pomeroy School for Boys. He turned pro late in 1942, defeating Frankie Mayo by six-round decision at the Olympia Athletic Club in South Philly for his first win as a professional. He was only 17 years old. Palermo was a notorious figure in boxing with ties to organized crime that helped him control a large stable of boxers, including Dorsey Lay. 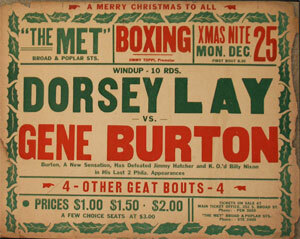 He built his boxing career at the legendary “Slaughterhouse Gym”, a hotbed of boxing talent in Philadelphia. Although in those days almost every street corner in Philadelphia had a gym that was jam-packed with serious boxing talent, the Slaughterhouse (aka Johnny Madison’s Gym) was certainly one of the very best. 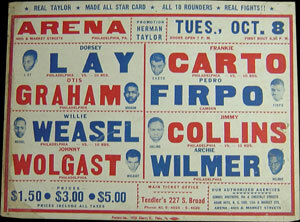 In his professional campaign, Lay faced some of the best boxers of his day. 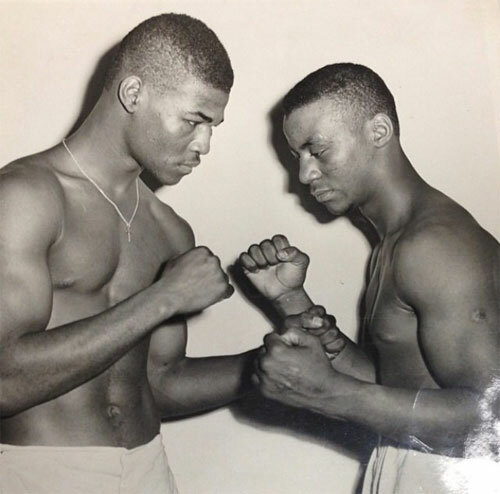 Dorsey’s biggest victories were against the likes of Otis Graham, Eddie Giosa, Freddie Dawson, Gene Burton, Santa Bucca, Ellis Phillips, George LaRover, Vince Dell’Orto and Speedy Lawrence. However, Lay had legends like Trenton’s Ike Williams and North Philadelphian Wesley Mouzon, both in their primes, standing as obstacles to his advancement in the division. He fought them both in 1945 – along with eight others that same year. Talk about poor timing. 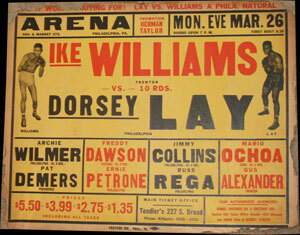 Lay, 24-4-1, faced the great Ike Williams, then 62-7-1, just one bout before Williams won the NBA world title. Williams won the fight in round three before a crowd of 7,200 at the Arena. Wesley Mouzon was a teenage phenomenon whose career was cut short due to a detached retina by the time he was just 19 years old. However, when Lay faced him, Mouzon still looked like a sure bet to become a world champion. 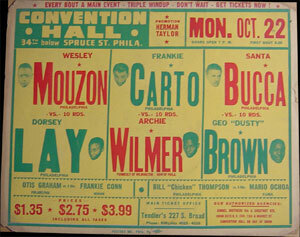 Their fight was a terrific scrap watched by 8,000 fans at Philadelphia’s Convention Hall. Mouzon had the power advantage, but Lay made it a tough fight with his speedy and elusive style. Lay moved against Mouzon. It was a fight that Philadelphia Inquirer writer John Webster called “a desperately-fought lightweight duel” and a “showy battle”. The fight was stopped after the eighth round. Dorsey continued to fight after his two highest profile bouts. Twenty three more fights would follow, with Lay winning twelve and losing eleven of them. As his career faded, Lay’s tender eye tissue caught up with him. After splitting two bouts with Speedy Lawrence in 1948, Lay hung up his gloves for good. “I didn’t have vision problems (then), I just bled a lot,” Lay said. Eventually, Dorsey Lay went completely blind. However, he led a full life after his ring career - with sight and then without. Over the years he was a husband, a father of two boys, a grandfather of two, and a great grandfather of four. 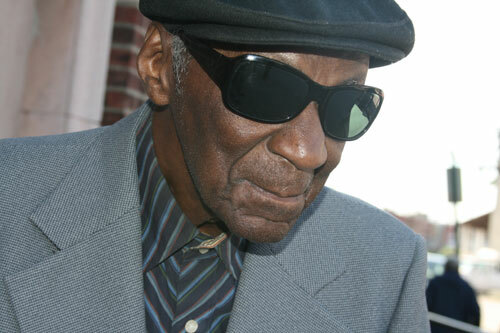 Sometime in mid-life, he went completely blind and lived without sight for almost forty years. In 2012, Lay was inducted into the Pennsylvania Boxing Hall of Fame, an honor that he welcomed after having such a storied boxing career. Lay had fond memories of his days as a boxer, and was proud to be part of Philly’s great history in the sport. Though Lay said that he gave away everything he earned, his biggest gifts were the things he gave in the ring. He fought during a time when boxers had to be durable and active and willing to risk everything against the very best of opposition. Dorsey gave boxing fans a great deal, but not just the clothes off his back. He gave his flesh and blood. He gave his youth, and he gave his sight. On March 17th, Dorsey Lay joined them – Montgomery, Mouzon, Williams, and all the other legends. It was inevitable. Like Johnny Madison’s Gym, all the greatest fighters go there. 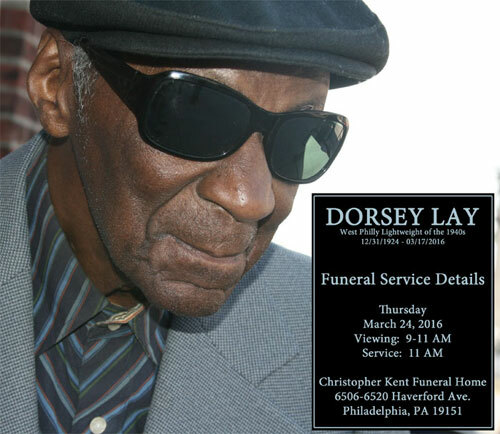 Funeral services for Dorsey Lay will be held on Thursday, March 24, 2016, at Christopher Kent Funeral Home, 6506-6520 Haverford Avenue, Philadelphia, PA, 19151. Viewing: 9-11 AM, Memorial Service: 11 AM. For more info, please call 215-748-1900.